This crest is used to open the East door of the southeastern-most guest room (the set of 7 rooms west of the manor proper's foyer). The secret wall within leads to secondary crypts where the Funeral Curate and crypt dust groundspawn can be found (parts of the lengthy monocle of blood quest). Anything special about using it? tried that door and all locked doors in that guest hallway, and would not open. 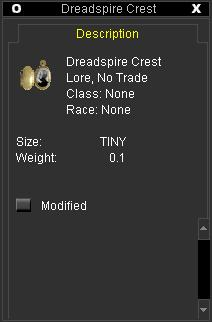 Tried with it in inventory and with it on cursor. Is crest from zombie (in crypt) exact same as crest from named spider in pit, or might they be two different crests? The door's not in the hallway, it's at (2535, 100, 128) on the east side of the room like he said. Key does not have to be on your cursor. Also drops from The Restless One. Had one drop tonight.